A lepton is an elementary, spin-1⁄2 particle that does not undergo strong interactions, but is subject to the Pauli exclusion principle. The best known of all leptons is the electron, which governs nearly all of chemistry as it is found in atoms and is directly tied to allchemical properties. Two main classes of leptons exist: charged leptons (also known as the electron-like leptons), and neutral leptons (better known as neutrinos). Charged leptons can combine with other particles to form various composite particles such as atoms andpositronium, while neutrinos rarely interact with anything, and are consequently rarely observed. τ). Electrons have the least mass of all the charged leptons. The heavier muons and taus will rapidly change into electrons through a process of particle decay: the transformation from a higher mass state to a lower mass state. Thus electrons are stable and the most common charged lepton in the universe, whereas muons and taus can only be produced in high energy collisions (such as those involving cosmic rays and those carried out inparticle accelerators). The first charged lepton, the electron, was theorized in the mid-19th century by several scientists and was discovered in 1897 byJ. J. Thomson. The next lepton to be observed was the muon, discovered by Carl D. Anderson in 1936, but it was erroneously classified as a meson at the time. After investigation, it was realized that the muon did not have the expected properties of a meson, but rather behaved like an electron, only with higher mass. It took until 1947 for the concept of “leptons” as a family of particle to be proposed. The first neutrino, the electron neutrino, was proposed by Wolfgang Pauli in 1930 to explain certain characteristics of beta decay. It was first observed in the Cowan–Reines neutrino experiment conducted by Clyde Cowan and Frederick Reines in 1956. The muon neutrino was discovered in 1962 by Leon M. Lederman, Melvin Schwartz and Jack Steinberger, and the tau discovered between 1974 and 1977 by Martin Lewis Perl and his colleagues from the Stanford Linear Accelerator Center and Lawrence Berkeley National Laboratory. The tau neutrino remained elusive until July 2000, when the DONUT collaboration from Fermilab announced its discovery. Following a suggestion of Prof. C. Møller, I adopt — as a pendant to “nucleon” — the denomination “lepton” (from λεπτός, small, thin, delicate) to denote a particle of small mass. The etymology incorrectly implies that all the leptons are of small mass. When Rosenfeld named them, the only known leptons were electrons and muons, which are in fact of small mass — the mass of an electron (0.511 MeV/c2) and the mass of a muon (with a value of 105.7 MeV/c2) are fractions of the mass of the “heavy” proton (938.3 MeV/c2). However, the mass of the tau (discovered in the mid 1970s) (1777 MeV/c2) is nearly twice that of the proton, and about 3,500 times that of the electron. A muon transmutes into a muon neutrino by emitting a W− boson. TheW− boson subsequently decays into anelectron and an electron antineutrino. The first lepton identified was the electron, discovered by J.J. Thomson and his team of British physicists in 1897. Then in 1930 Wolfgang Pauli postulated the electron neutrino to preserveconservation of energy, conservation of momentum, and conservation of angular momentum in beta decay. Pauli theorized that an undetected particle was carrying away the difference between theenergy, momentum, and angular momentum of the initial and observed final particles. The electron neutrino was simply called the neutrino, as it was not yet known that neutrinos came in different flavours (or different “generations”). Nearly 40 years after the discovery of the electron, the muon was discovered by Carl D. Anderson in 1936. Due to its mass, it was initially categorized as a meson rather than a lepton. It later became clear that the muon was much more similar to the electron than to mesons, as muons do not undergo the strong interaction, and thus the muon was reclassified: electrons, muons, and the (electron) neutrino were grouped into a new group of particles – the leptons. In 1962 Leon M. Lederman, Melvin Schwartz and Jack Steinberger showed that more than one type of neutrino exists by first detecting interactions of themuon neutrino, which earned them the 1988 Nobel Prize, although by then the different flavours of neutrino had already been theorized. The tau was first detected in a series of experiments between 1974 and 1977 by Martin Lewis Perl with his colleagues at the SLAC LBL group. Like the electron and the muon, it too was expected to have an associated neutrino. The first evidence for tau neutrinos came from the observation of “missing” energy and momentum in tau decay, analogous to the “missing” energy and momentum in beta decay leading to the discovery of the electron neutrino. The first detection of tau neutrino interactions was announced in 2000 by the DONUTcollaboration at Fermilab, making it the latest particle of the Standard Model to have been directly observed, apart from the Higgs boson, which probably has been discovered in 2012. Although all present data is consistent with three generations of leptons, some particle physicists are searching for a fourth generation. The current lower limit on the mass of such a fourth charged lepton is 100.8 GeV/c2, while its associated neutrino would have a mass of at least 45.0 GeV/c2. Leptons are spin-1⁄2 particles. The spin-statistics theorem thus implies that they are fermions and thus that they are subject to the Pauli exclusion principle; no two leptons of the same species can be in exactly the same state at the same time. Furthermore, it means that a lepton can have only two possible spin states, namely up or down. A closely related property is chirality, which in turn is closely related to a more easily visualized property called helicity. The helicity of a particle is the direction of its spin relative to its momentum; particles with spin in the same direction as their momentum are called right-handed and otherwise they are called left-handed. When a particle is mass-less, the direction of its momentum relative to its spin is frame independent, while for massive particles it is possible to ‘overtake’ the particle by a Lorentz transformation flipping the helicity. Chirality is a technical property (defined through the transformation behaviour under the Poincaré group) that agrees with helicity for (approximately) massless particles and is still well defined for massive particles. In many quantum field theories—such as quantum electrodynamics and quantum chromodynamics—left and right-handed fermions are identical. However in the Standard Model left-handed and right-handed fermions are treated asymmetrically. Only left-handed fermions participate in the weak interaction, while there are no right-handed neutrinos. This is an example of parity violation. In the literature left-handed fields are often denoted by a capital L subscript (e.g. e−L) and right-handed fields are denoted by a capital R subscript. In the language of quantum field theory the electromagnetic interaction of the charged leptons is expressed by the fact that the particles interact with the quantum of the electromagnetic field, the photon. 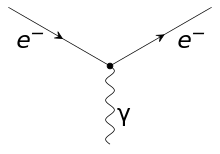 The Feynman diagram of the electron-photon interaction is shown on the right. eL, e−L) that transforms in the spinor representation (T = 1⁄2) of the weak isospinSU(2) gauge symmetry. This means that these particles are eigenstates of the isospin projection T3 with eigenvalues 1⁄2 and −1⁄2 respectively. In the meantime, the right-handed charged lepton transforms as a weak isospin scalar (T = 0) and thus does not participate in the weak interaction, while there is no right-handed neutrino at all. R must haveYW = −2. The interaction of the leptons with the massive weak interaction vector bosons is shown in the figure on the left. In the Standard Model each lepton starts out with no intrinsic mass. The charged leptons (i.e. the electron, muon, and tau) obtain an effective mass through interaction with theHiggs field, but the neutrinos remain massless. For technical reasons the masslessness of the neutrinos implies that there is no mixing of the different generations of charged leptons as there is for quarks. This is in close agreement with current experimental observations. It is however known from experiment – most prominently from observed neutrino oscillations – that neutrinos do in fact have some very small mass, probably less than2 eV/c2. This implies that there are physics beyond the Standard Model. The currently most favoured extension is the so-called seesaw mechanism, which would explain both why the left-handed neutrinos are so light compared to the corresponding charged leptons, and why we have not yet seen any right-handed neutrinos. The members of each generation’s weak isospin doublet are assigned leptonic numbers that are conserved under the Standard Model. Electrons and electron neutrinos have anelectronic number of Le = 1, while muons and muon neutrinos have a muonic number of Lμ = 1, while tau particles and tau neutrinos have a tauonic number of Lτ = 1. The antileptons have their respective generation’s leptonic numbers of −1. Each generation forms a weak isospindoublet. Z0 → μ− + τ+. The coupling of the leptons to gauge bosons are flavour-independent (i.e., the interactions between leptons and gauge bosons are the same for all leptons). This property is called lepton universality and has been tested in measurements of the tau and muon lifetimes and of Z boson partial decay widths, particularly at the Stanford Linear Collider (SLC) and Large Electron-Positron Collider (LEP) experiments. where B(x → y) and Γ(x → y) denotes the branching ratios and the resonance width of the process x → y. Using the values of the 2008 Review of Particle Physics for the branching ratios of muons and tau yields a lifetime ratio of ~1.29×10−7, comparable to the measured lifetime ratio of ~1.32×10−7. The difference is due to K1 and K2 not actually being constants; they depend on the mass of leptons.